Growth has picked up again in 2017, and the positive trend is expected to continue in 2018, with both domestic demand and exports set to grow further. 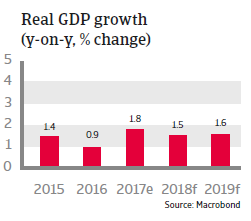 With GDP growth of 1.8% in 2017 Japan´s economic expansion was higher than originally expected, mainly due to stronger external demand and a supportive fiscal policy. 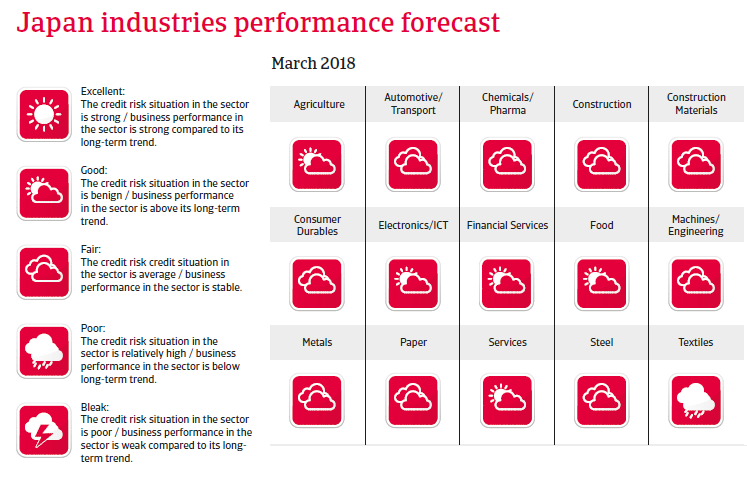 This positive trend is expected to continue in 2018, with the economy forecast to grow 1.5%, mainly driven by domestic demand. 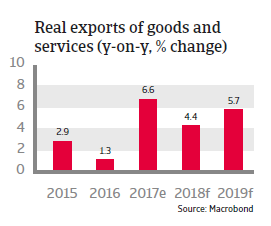 Exports increased by more than 6% in 2017, mainly helped by depreciation of the yen against the USD since the end of 2016 and a pick-up in private investment. Tighter labour market conditions and increasing bank lending to non-financial firms are pushing up domestic demand. 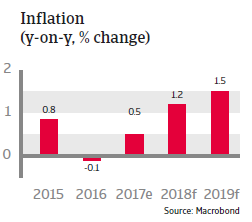 Stronger domestic activity has put upward pressure on inflation, which increased to 0.5% in 2017 after deflation had returned in 2016 (triggered by a strong yen and low oil prices). Consumer prices are expected to increase further in 2018 due to higher oil prices and the weaker yen, but low wage growth inflation is expected to remain far below the 2% target set by the government. Therefore, the Bank of Japan is set to keep its monetary policy ultra-loose with negative rates unchanged in 2018, while the government continues with its stimulus programmes. 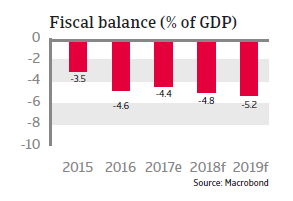 Following a long period of loose fiscal policy, the Japanese government is struggling with extremely high public debt (about 220% of GDP in 2017). Japan relies mostly on domestic creditors to support its government debt (about 90% is held by Japanese investors), which makes the funding base less susceptible to capital flight. But maintaining this level of debt is costly, and further increasing government debt would at some point render it unsustainable. Japan faces some major challenges. In addition to the high fiscal deficit, the country faces demographic challenges: the population is shrinking and the working age population is also declining. Without appropriate measures, Japan will inevitably face a shrinking tax base and rising expenditures on retirement benefits. Many industries already face some difficulties due to labour shortages, leading to higher labour costs which is hurting their international competitiveness. To achieve a sustainable rebound and to boost the country’s long-term economic performance, there is an urgent need to make the labour market more flexible, to end protection for farmers, doctors and pharmaceutical companies, and to introduce more business deregulation. The government has repeatedly announced its intention to tackle those issues in its current term, but all of those reforms are still vehemently opposed by powerful interest groups. Still it remains to be seen if and when deep structural reforms will be made. The total value of B2B sales on credit in Japan increased this year to 53.7%. Of the Asia Pacific countries surveyed, Japan was the most credit-friendly. 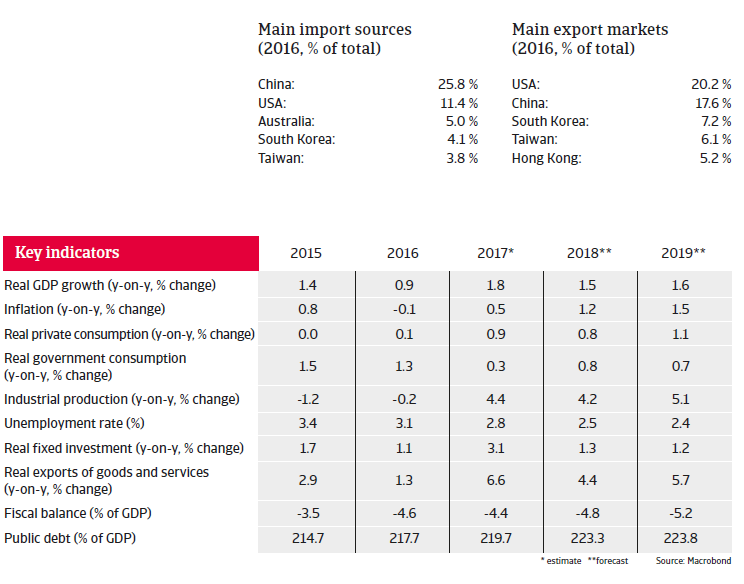 The economic recovery in emerging market economies is expected to continue strengthening in 2018 and these markets could present opportunities for business. Designed for multinational clients, Atradius Global sees your business as a whole while providing on-the-ground local support that mirrors your own geographical reach and multilingual policies. The statements made herein are provided solely for general informational purposes and should not be relied upon for any purpose. Please refer to the actual policy or the relevant product or services agreement for the governing terms. Nothing herein should be construed to create any right, obligation, advice or responsibility on the part of Atradius, including any obligation to conduct due diligence of buyers or on your behalf. If Atradius does conduct due diligence on any buyer it is for its own underwriting purposes and not for the benefit of the insured or any other person. Additionally, in no event shall Atradius and its related, affiliated and subsidiary companies be liable for any direct, indirect, special, incidental, or consequential damages arising out of the use of the statements made information herein.